Download "PROTOCOL ON CLAIMS, LEGAL PROCEEDINGS AND INDEMNIFICATION. To the. 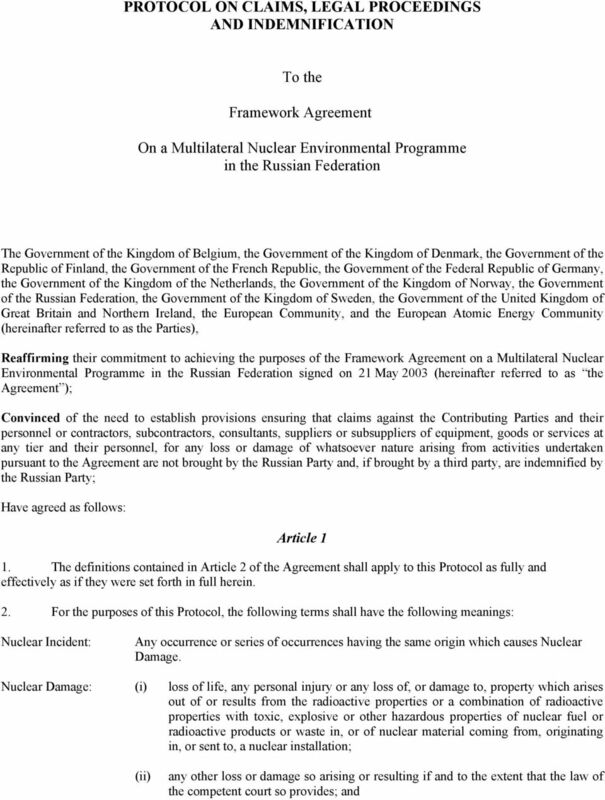 Framework Agreement"
2 (iii) if the law of the State in which the nuclear installation of the liable operator is situated so provides, loss of life, any personal injury or any loss of, or damage to, property which arises out of or results from other ionising radiation emitted by any other source of radiation inside a nuclear installation. 3. For the purposes of this Protocol, whenever both Nuclear Damage and damage other than Nuclear Damage have been caused by a Nuclear Incident, or jointly by a Nuclear Incident and one or more other occurrences, such other damage shall, to the extent that it is not reasonably separable from the Nuclear Damage, be deemed, for the purposes of this Protocol, to be Nuclear Damage caused by that Nuclear Incident. Article 2 1. With the exception of claims for injury or damage against individuals arising from omissions or acts of such individuals done with intent to cause injury or damage, the Russian Party shall bring no claims or legal proceedings of any kind against the Contributors and their personnel or contractors, subcontractors, consultants, suppliers or subsuppliers of equipment, goods or services at any tier and their personnel, for any loss or damage of whatsoever nature, including but not limited to personal injury, loss of life, direct, indirect and consequential damage to property owned by the Russian Federation arising from activities undertaken pursuant to the Agreement. This paragraph shall not apply to the enforcement of the express provisions of a contract. 2. 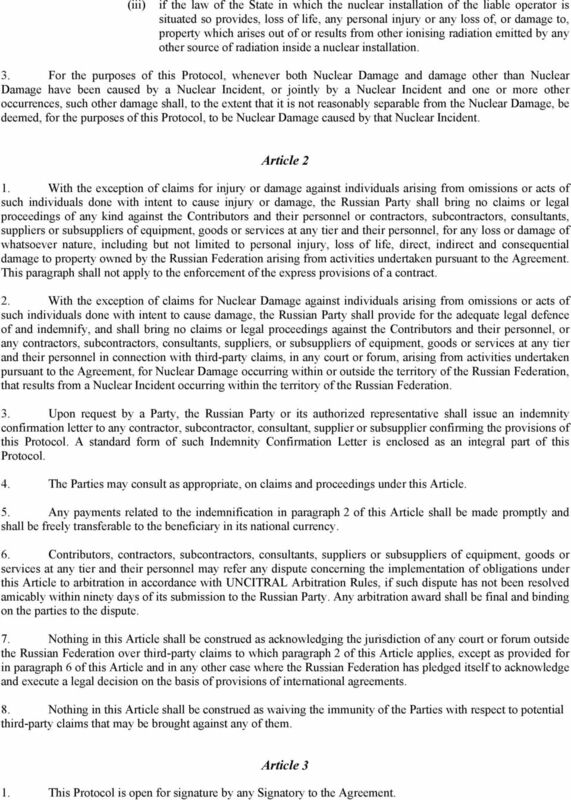 With the exception of claims for Nuclear Damage against individuals arising from omissions or acts of such individuals done with intent to cause damage, the Russian Party shall provide for the adequate legal defence of and indemnify, and shall bring no claims or legal proceedings against the Contributors and their personnel, or any contractors, subcontractors, consultants, suppliers, or subsuppliers of equipment, goods or services at any tier and their personnel in connection with third-party claims, in any court or forum, arising from activities undertaken pursuant to the Agreement, for Nuclear Damage occurring within or outside the territory of the Russian Federation, that results from a Nuclear Incident occurring within the territory of the Russian Federation. 3. Upon request by a Party, the Russian Party or its authorized representative shall issue an indemnity confirmation letter to any contractor, subcontractor, consultant, supplier or subsupplier confirming the provisions of this Protocol. A standard form of such Indemnity Confirmation Letter is enclosed as an integral part of this Protocol. 4. The Parties may consult as appropriate, on claims and proceedings under this Article. 5. Any payments related to the indemnification in paragraph 2 of this Article shall be made promptly and shall be freely transferable to the beneficiary in its national currency. 6. Contributors, contractors, subcontractors, consultants, suppliers or subsuppliers of equipment, goods or services at any tier and their personnel may refer any dispute concerning the implementation of obligations under this Article to arbitration in accordance with UNCITRAL Arbitration Rules, if such dispute has not been resolved amicably within ninety days of its submission to the Russian Party. Any arbitration award shall be final and binding on the parties to the dispute. 7. Nothing in this Article shall be construed as acknowledging the jurisdiction of any court or forum outside the Russian Federation over third-party claims to which paragraph 2 of this Article applies, except as provided for in paragraph 6 of this Article and in any other case where the Russian Federation has pledged itself to acknowledge and execute a legal decision on the basis of provisions of international agreements. 8. Nothing in this Article shall be construed as waiving the immunity of the Parties with respect to potential third-party claims that may be brought against any of them. Article 3 1. This Protocol is open for signature by any Signatory to the Agreement. 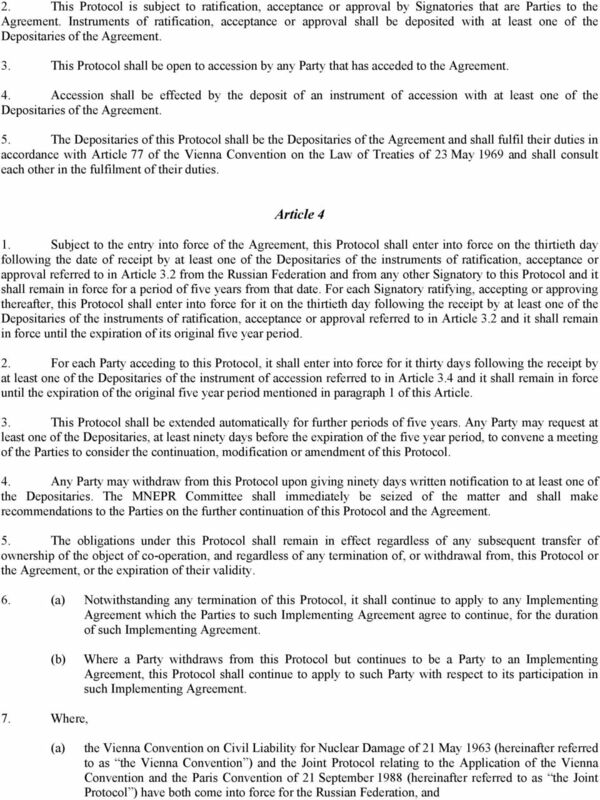 4 (b) the Vienna Convention or the Paris Convention on Third Party Liability in the Field of Nuclear Energy of 29 July 1960 and the Joint Protocol have both come into force for any other Party to this Protocol, such other Party may, in its discretion and by notice in writing to the Russian Federation, terminate the application of Article 2.2 of this Protocol as between it and the Russian Federation with respect to any activity undertaken pursuant to the Agreement to which these instruments apply. The Russian Federation and such other Party shall each inform the other in writing of the dates upon which such instruments come into force in their respective territories. 8. This Protocol shall be applied on a provisional basis from the date of its signature. Done at Stockholm on 21 May 2003 in the English, French and Russian languages, all texts being equally authentic, in two originals of which one shall be deposited in the archives of the Ministry of Foreign Affairs of the Russian Federation and one in the archives of the Organisation for Economic Co-operation and Development. Duly certified copies of this Protocol shall be transmitted to the Signatories and acceding Parties. In the event of any dispute or divergence in relation to this Protocol the English text shall prevail for the purposes of interpretation. 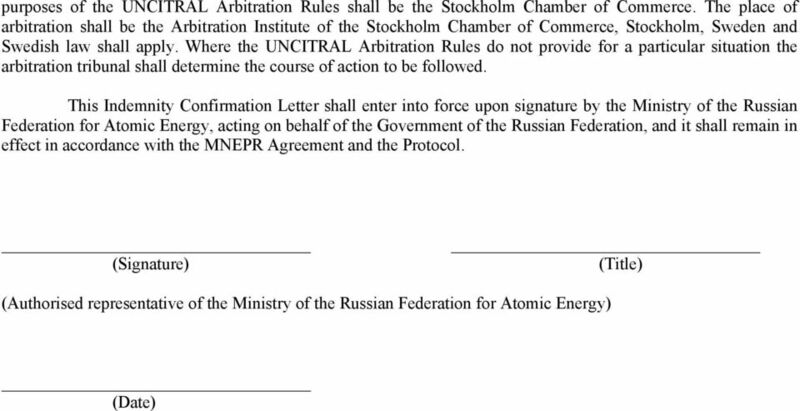 5 Annex Model of an INDEMNITY CONFIRMATION LETTER to be provided by The Ministry of the Russian Federation for Atomic Energy to [Contractor] 1 Dear Sirs, The Government of the Russian Federation and [name of other Party] are Parties to the Framework Agreement on a Multilateral Nuclear Environmental Programme in the Russian Federation (hereinafter referred to as the MNEPR Agreement ) of 21 May 2003 to facilitate co-operation in the area of safety of spent nuclear fuel and radioactive waste in the Russian Federation. They are also Parties to the Protocol to the MNEPR Agreement on Claims, Legal Proceedings and Indemnification of 21 May 2003 (hereinafter referred to as the Protocol ). The Ministry of the Russian Federation for Atomic Energy, acting on behalf of the Government of the Russian Federation, hereby acknowledges that [Contractor] has entered into an [Implementing Agreement/Agreement/Contract] with [Recipient] on [date] to provide Assistance for the implementation of the MNEPR Project known as [Project name]. The persons and entities identified in the attached list are the [Contractor s] personnel, subcontractors, suppliers, subsuppliers and consultants who will be providing equipment, goods or services pursuant to the [Implementing Agreement/Agreement/Contract]. [Contractor] may amend this list, from time to time, upon notification to the Ministry of the Russian Federation for Atomic Energy or its authorized representative for the implementation of the [Project name]. The Ministry of the Russian Federation for Atomic Energy, acting on behalf of the Government of the Russian Federation, confirms that in accordance with Articles 2.1 and 2.2 of the Protocol, a) with the exception of claims for injury or damage against individuals arising from omissions or acts of such individuals done with intent to cause injury or damage, it will bring no claims or legal proceedings of any kind against [Contractor] and its personnel or subcontractors, consultants, suppliers or subsuppliers of equipment, goods or services at any tier and their personnel identified in the attached list as amended from time to time, for any loss or damage of whatsoever nature, including but not limited to personal injury, loss of life, direct, indirect and consequential damage to property owned by the Russian Federation arising from activities undertaken pursuant to the MNEPR Agreement, it being agreed that this paragraph shall not apply to the enforcement of the express provisions of a contract; and b) with the exception of claims for Nuclear Damage against individuals arising from omissions or acts of such individuals done with intent to cause damage, it shall provide for the adequate legal defence of, and indemnify, and shall bring no claims or legal proceedings against [Contractor] and its personnel or any subcontractors, consultants, suppliers, or subsuppliers of equipment, goods or services at any tier and their personnel identified in the attached list as amended from time to time, in connection with third-party claims, in any court or forum, arising from activities undertaken pursuant to the MNEPR Agreement, for Nuclear Damage occurring within or outside the territory of the Russian Federation, that results from a Nuclear Incident occurring within the territory of the Russian Federation. 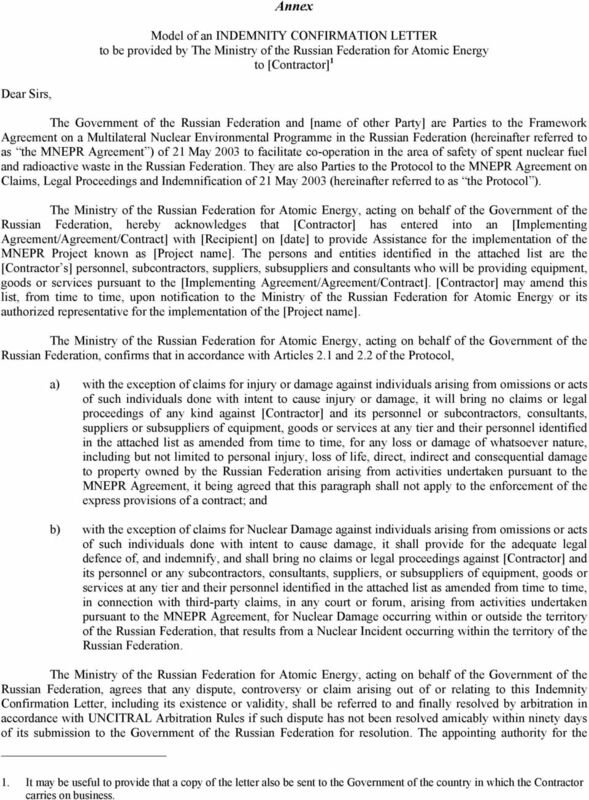 The Ministry of the Russian Federation for Atomic Energy, acting on behalf of the Government of the Russian Federation, agrees that any dispute, controversy or claim arising out of or relating to this Indemnity Confirmation Letter, including its existence or validity, shall be referred to and finally resolved by arbitration in accordance with UNCITRAL Arbitration Rules if such dispute has not been resolved amicably within ninety days of its submission to the Government of the Russian Federation for resolution. The appointing authority for the 1. It may be useful to provide that a copy of the letter also be sent to the Government of the country in which the Contractor carries on business. Nordic Imbalance Settlement. Agreement on Pledge and Right of Disposal of Cash Account. between. [name of Balance Responsible Party] and. IRAN SOUTH AFRICA BILATERAL INVESTMENT TREATY. Official Gazette of the Islamic Republic of Iran No., 16244 Dated Nov. 28, 2000, Page 2.